The Last Guardian is one of the most bittersweet games I’ve ever played in terms of an overall experience. Team Ico’s latest adventure had me clutching in frustration, and gasping in awe all at the same time. The game has some fantastic moments, and pulls on all the right strings. That being said It also has some major problems that really hold the game back. The game does so much right, and it tells such a beautiful story, it’s a shame the final product didn’t reach the tremendous potential it had. The game begins with young boy as he wakes up in a strange castle. He wakes next to a giant – dog like creature Trico. Together, they work together to escape the crumbling castle as they try to figure out where they are, and what they’re doing. The player and creature begin to form a strong bond much like the real life relationship between a man and his dog. This relationship is the centerpiece of the journey. As the game goes on, the bond between the child and the creature becomes stronger and stronger. I felt myself getting sad every time the game separated me from my canine partner, but joyful upon his return. Trico and the boy come to rely on each other for more than just getting through the castle. Trico becomes the boys protector, or guardian if you will. He is the only thing standing between the boy, and the evil forces inside the castle. The main quest between Trico and the player isn’t the only story telling element. The simple chatter between the two in between puzzles is the glue that holds this game together. Even though they aren’t speaking in an actual language, their mannerisms and expressions tell an entire story in their own right. The emotional change these two go through over the course of the game is astounding. The environment they find themselves in is just as interesting as the two characters. The castle they are in is mysterious, and ripe for exploration. I wanted to discover every inch of the map in hopes of determining what the place is or why I’m here. The world is truly fascinating. 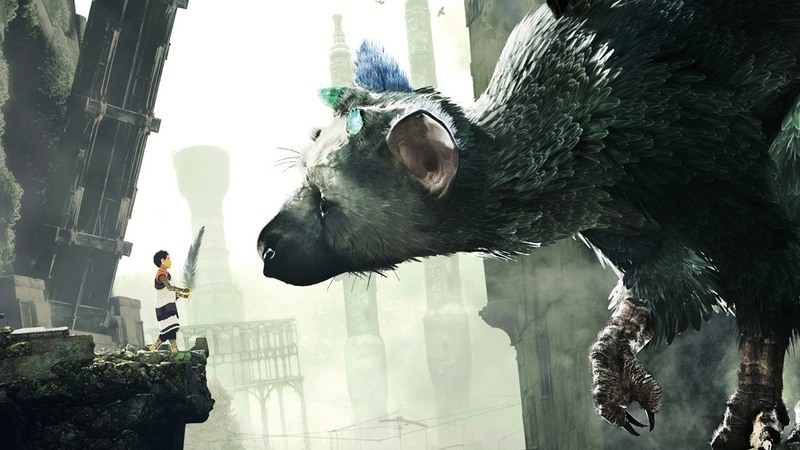 Many of the puzzles involve commanding Trico to move to certain places, or jump up to a ledge. Countless times during my playthrough I found myself spamming all the commands just to get Trico to react. At one instance during the game Trico needs to jump across a series of about six ledges to advance. After getting him to the last ledge I felt such a feeling of relief and accomplishment; just to be instantly filled with frustration after he turned around and jumped all the way back for reasons I cannot explain. The camera movements leave much to be desired. They are slow and clumsy. It isn’t much of an issue in the wide open spaces, but when the game brings you into tight hallways, and small tunnels, the camera can actually become a problem. The game looks fantastic. The art style is incredible, and the feathers, movements and animations of Trico are a marvel. The game’s open world is breathtaking at times. The scope of these puzzles, and the size of the set pieces are much larger than I anticipated, and they really show of the beauty of the game. The Last Guardian is by all means worth the ten hours I spent with it. It’s beautiful, it’s heartfelt, incredibly emotional, and even breathtaking at times. The game is surprisingly large and has a much larger scope than it may seem. The scale of certain set pieces and puzzles had me in awe, but it’s the dated feel of the controls and movements that hinder an overall great experience. If you are a fan of Team Ico’s preview work, Shadow of the Colossus and Ico, you may very much enjoy this game. If you are a fan of emotional experiences, character driven stories, and giant bird dogs check it out.